Reaction in the Middle East to US President Donald Trump's temporary travel ban on people from seven Muslim-majority countries has ranged from outrage to, in some cases, sympathy. Many Arabic dailies condemn the move as "racist" and inconsistent with US values, while in Iran there have been calls for the government to respond in kind. However, the reaction in some of the Saudi and Gulf press has been more muted, and there have been mixed views on social media. An editorial in Iraq's Al-Adala, the mouthpiece of the Shia Islamic Supreme Council political party, sees in the decision "flagrant evidence of racist policies". It lashes out at "this abuse from a country that claims to be democratic and respectful of human rights" and wonders what effect it will have on the strategic agreement between the US and Iraq, asking: "Does the agreement have any significance after these discriminatory measures?" Ali Nun in Lebanese Al-Mustaqbal - owned by Prime Minister Saad Hariri - says that "Trump's decision cannot be seen but as a collective punishment" that has "poisonous and detestable racist roots" and "has nothing to do with Western norms of justice and democracy". Echoing the sentiments, Ahmed Mansour in Qatari pro-government Al-Watan says that "Trump's war against what he calls extremist Islam begins with those who say 'I bear witness that there is no god but God' [Islamic testament of faith] and ends with Daesh [Islamic State]". London-based Al-Arab says that "Trump has conveyed a message to the Muslim world to the effect that the policy of rapprochement is over". The paper notes that "Trump has an ability to create chaos through his decision, which astonished critics and supporters at the same time." An editorial in Saudi pro-government Al-Riyadh is more muted, expressing concern about the relationship between Washington and Arab and Muslim countries and calling for "wise decisions to defuse tension in the region, which is supposed to turn a new page of balanced relations [with the USA] that would serve the interests of the different sides". In London-based, Saudi-funded Al-Sharq al-Awsat, Tariq al-Hamid criticises some of the countries covered by the ban. "After years of hostility towards the USA, why is Iran angry with Trump's decision? Why those who adopt a fundamentalist Islamist discourse are angry with the decision although they had spent years in spreading hatred against America?" he wonders. 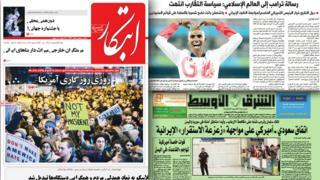 Iranian newspapers and broadcast media report prominently on the protests in the US against the travel ban, with reformist newspaper Ebtekar and conservative Khorasan publishing large photos of the protests on their front pages. A commentary in Iran's hardline Javan newspaper urges the Iranian authorities to take "reciprocal" steps against the ban. It says that Mr Trump's recent acts demonstrate "ill intentions" which are in "open violation" of the provisions of the Iran nuclear deal, which urge that "goodwill" should be demonstrated while the deal is being implemented. Iran's Keyhan voices similar views in a commentary headlined "Banning US citizens from entering Iran is the minimum of what is expected from the government". Rolling news channel IRINN quotes Deputy Foreign Minister Qashqavi as saying that "Iran will respond to the illegal measures of the US president". Users of Arabic social media appear to be divided in their responses to the ban. Some express disapproval at the apparent selectivity of the ban while others defend the measure. Some Iraqi users wonder why Iraq was included in the ban while Saudi Arabia was excluded. Other users, however, praise the US move, expressing astonishment at Arabs' criticism of the ban in light of difficulties put in the way of Syrian refugees getting visas by almost all Arab countries. Dubai's deputy police chief, Dhahi Khalfan Tamim (@Dhahi_Khalfan, with 1.58m followers), says it was "a sound decision to impose a travel ban on the nationals of the countries affiliated to Iran as well as Iranian nationals". He tweets in Arabic: "They curse America and invoke destruction, then they weep for imposing a travel ban on them, they are idiots." Firas Tlass, an influential politician and son of a former Syrian defence minister, writes on Facebook: "Gulf countries and Turkey have prevented Syrians from obtaining visas. So leave Trump alone!" Saudi journalist Aziz al-Qenaei also tweets: "When you want to criticise Trump, you should reform yourself and your society, culture and religious behaviour so that your argument becomes more rational."